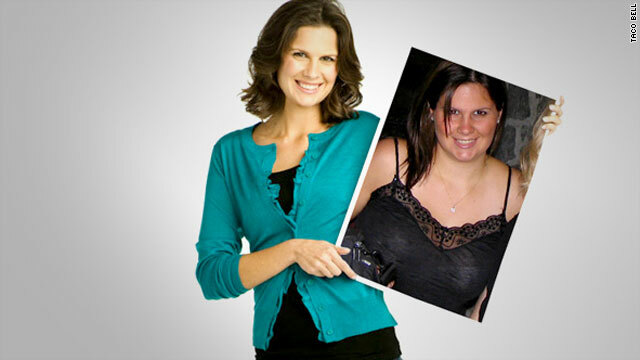 Christine Dougherty is the face of a Taco Bell ad campaign, flaunting her new figure after eating lower-calorie items. (CNN) -- The company that brought us the taco-craving Chihuahua, Fourth Meal and double-decker tacos suggests that it can now help fight fat. In an ad campaign much like Subway's Jared Fogle spots, Taco Bell has introduced its own weight-loss character. Christine Dougherty, 27, ate items from Taco Bell's lower-calorie "Fresco menu" five to eight times a week and dropped 54 pounds, according to the company. While welcoming the fast-food chain's lower-calorie options, some nutritional experts say the Taco Bell ads could be misleading. In the commercial, Dougherty shows off her svelte body in a form-fitting dress and later a purple bikini while showing photos of her once-chubbier self. "I lost about two pounds a month over a period of two years by reducing my daily calories and replacing my typical fast-food lunch or dinner with something from the Taco Bell Drive-Thru Diet," Dougherty says in the commercial. "I just chose smarter options." These options did not include cheesy gorditas or half-pound burritos. Dougherty caught the attention of the company after writing to Taco Bell about her dieting success story. Starting in 2007, the Pensacola, Florida, resident cut 500 calories from her diet and limited herself to 1,250 a day, according to the ads. She replaced her regular Taco Bell meals with the chain's Fresco items: seven tacos and burritos that range from 150 to 340 calories. The Fresco fare is not cooked differently. The same burritos and tacos on the regular menu are stripped of shredded cheese and sauce; the items instead contain a tomato, onion and cilantro salsa. This substitution shaves off 20 to 100 calories, according to Taco Bell. Although the company calls its marketing effort the Drive-Thru Diet, among several flashing disclaimers is, "this is not a weight-loss program." "The disclaimers at the bottom, we say this is part of a lower calorie effort. We say you should exercise," said Tom Wagner, Taco Bell's vice president of consumer insights and lead project manager of the Drive-Thru Diet. "We don't in any way try to market this as a miracle solution to lose weight." Ruth Carey, a registered dietitian and spokeswoman for the Fresco Menu for Taco Bell, said, "If people eat items from the Drive-Thru item menu as part of an overall varied diet, it can be very healthy." Carey is not Dougherty's dietitian but learned about her eating patterns. When Dougherty began dieting, she continued eating out because she disliked cooking at home, Carey said. Carey said she would have preferred Dougherty exercised in addition to her calorie restriction, but her diet showed that "you can really lose weight by making small changes. ... Just reducing calories by 100 to 200 every day on a consistent basis also makes a difference in overall weight loss over a period of a year or two." Robert Keith, a professor of nutrition and food science at Auburn University, said it appears unlikely that Taco Bell itself transformed Dougherty. "Tons of various diets -- grapefruit diets, banana diets -- they all work for a while, because you don't eat many calories," he said. "If you eat fewer calories, it doesn't matter whether you eat Taco Bell, Subway, Atkins or the Dean Ornish diet. There's a lot of different ways. The idea is, you eat less calories. [The Taco Bell ads] don't dwell on the fact she didn't eat many calories. The bottom line is, she lost weight because she didn't eat a whole lot." Whenever you reduce by 500 calories and make reasonable healthy choices, you're going to lose weight. Joan Salge Blake, a registered dietitian and a spokeswoman for the American Dietetic Association, said that "there's nothing innately magical about Taco Bell" and that eating fewer calories "can be done at many eateries, in your own home. There's many ways to do this." Dr. Melina Jampolis, CNNhealth.com's Diet and Fitness expert and a physician nutrition specialist, said the Dougherty commercials leave the impression that tacos contributed to weight loss. "They're giving far too much credit to the Taco Bell product," she said. "Whenever you reduce by 500 calories and make reasonable, healthy choices, you're going to lose weight." Although Jampolis prefers her clients avoid fast food, she said it's not always realistic for people crunched for time or money. "If they had to [eat fast food], this is probably one of the better approaches," Jampolis said of Taco Bell's Fresco items. "The message should be: Find things that are healthy as possible that fit into the lifestyle." Asked whether she would recommend Dougherty's diet, which consisted heavily of fast food, dietitian Carey said, "I meet my clients where they are. If they are already going to a quick-service restaurant, I'm going to help them eat better there." Although the Fresco items tend to be high in sodium, Carey said, the consumer could balance it out by practicing moderation the rest of the day. A Drive-Thru Diet infomercial on Taco Bell's Web site plays on the dieting obsession and adopts a campy tone. In it, three people strain to fit into their clothes. The host demonstrates how one of the struggling dieters gets into a car and heads to the nearest Taco Bell drive-through. "It's the Drive-Thru Diet. That's what I think is funny," said dietitian Blake, a nutrition professor at Boston University. "I have to chuckle. One of the issues perpetuating weight problems is that we're more sedentary than ever. We shouldn't be going to the drive-through. At least park the car and walk in and get it."